For many industrial applications the Euro-Matic balls provides not just a ball, but a solution to a problem. 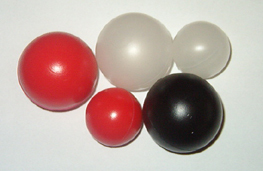 Hollow Euro-Matic balls save energy and control the expansion of fumes and smell. Euro-Matic floating ball blankets provide highly effective solutions to difficult liquid storage problems throughout the Processing, Petrochemical and Metal Treatment Industries. The low liquid surface area exposed to atmosphere dramatically reduces liquid loss trough evaporation, odour release to the atmosphere and conversely prevents surface absorption of oxygen. Generally Euro-Matic balls are used in: electroplating; phosphating; cooper refining; tank galvanization; fire hazards and so forth. In 1958 Euro-Matic was established as a manufacturer of plastic blowing machinery in Sweden. 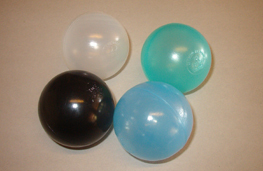 The company started producing hollow plastic balls in Denmark in 1965. The production process was taken over in 2005 by Weener Plastic Packing group and transferred to Hungary in 2007. A sales office for the EURO-MATIC balls was opened in Witzenhausen, Germany in 1980. From here, the company supports its business customers also in Austria, Netherland, Belgium and Scandinavia.